The rule is the same as the FreeCell of Windows. It is finish if all can carry out mark movement of the card of the same mark from a sequence in order from 1 to 13 to a home cell. One card can be put on each free cell. 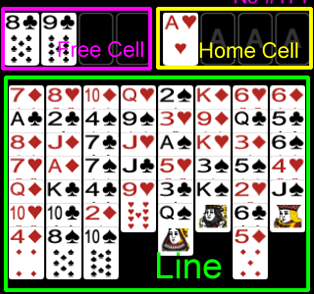 Before a line, the card with which a color small [ one ] is different can be placed. If a line becomes empty, it is countable as a free cell.